I have to confess I have never make snow skin mooncakes before. I saw so many bloggers making and they are so pretty. So I decided I should give it a try too, and I'm surprised it is so easy to make. I didn’t make the paste. The red wine berries paste from Kwong Cheong Thye <廣祥泰> is a winner! I bought their Hong Kong Fried Glutinous Rice Flour and Icing Sugar too, and I think they sell one of the better quality ones. 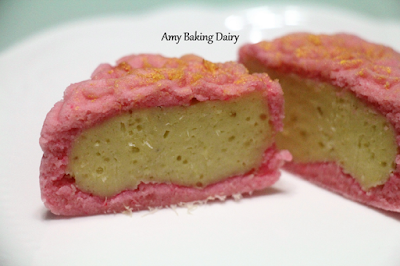 I have tried making traditional baked mooncake 2 years ago. You can find the post here. But I wasn’t too happy and had lots of difficulties with it. Haha! I think I would never want to make it again. I’m glad at least I attempted in making snow skin this time. I’m not sure whether I will be making it again next year. But if I can find special paste like this red wine berries, I’m sure I will make again. 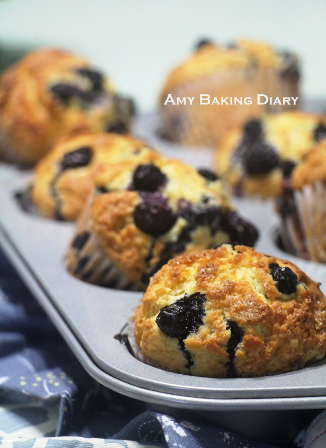 I find baking together with friend is a joy and I love to have friends coming over to bake. This is my 2nd time having Cecilia over. 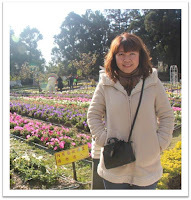 She is a lovely girl and always willing to share and impart her knowledge. 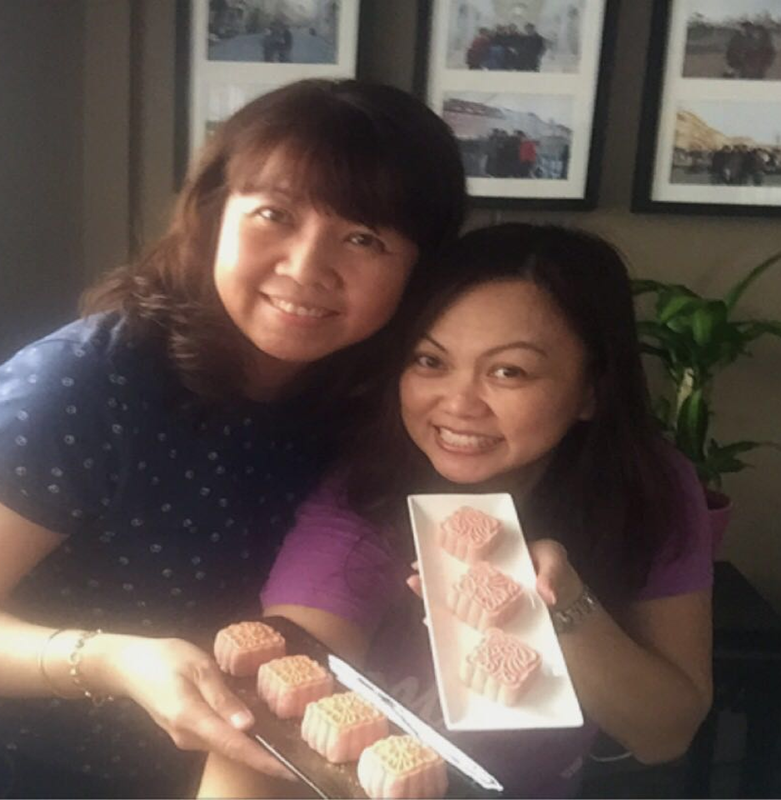 Cecilia brought some durian paste over and we also made some Durian Snow Skin Mooncake too. 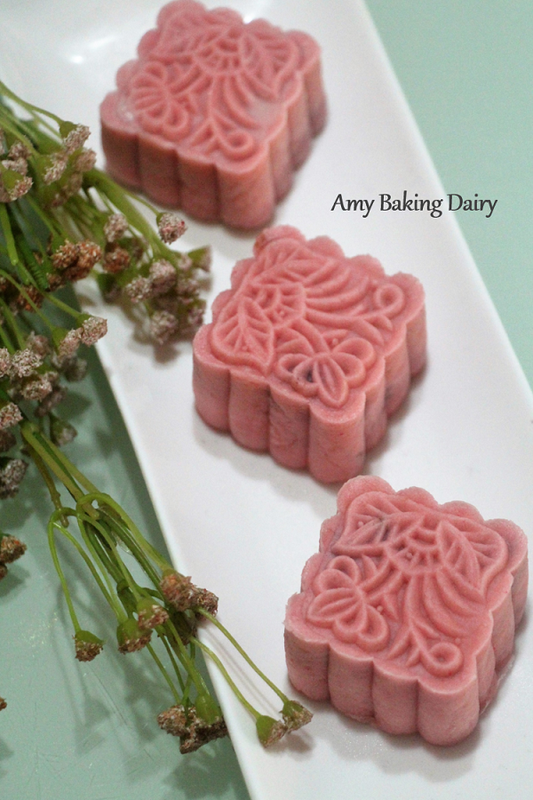 The whole process of making these mooncakes was fun. I really enjoyed making and love the outcome of these mooncakes. Boil about 1 litre of water with a bunch of pandan leave. Sieve the pandan leave water. Dropped a few drops of food colouring into it and stir. Refrigerate the pandan water until it is cold enough to use. You can prepare this 1 day before. Remove the paste from the packing and put it in a bowl. You can add additional red wine, if you could like to. Mix well. Divide the paste into 25g each and set aside. Mix all the ingredients together until they are well combine. Wrap it and store in the refrigerator until it is cold enough to work on it. Remove it from the refrigerator. Spread some glutinous flour on the working top. Remove the dough from the refrigerator and knead further until the dough is smooth. 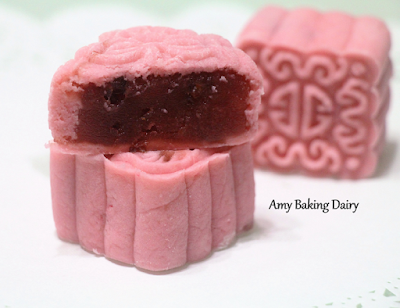 The size of my mooncake mold plunger is 4cm x 4cm. So I divided the dough into 20g each and shaped them into a ball. Lightly dust hand with some glutinous rice flour. Shape each dough into a ball. Flatten the ball and roll into a disc. Place 1 paste in the middle of the disc. Wrapped it around and shaped it into a ball. Carefully placed the ball into the mold plunger and slowly pressed out the mooncake. The mooncake comes out nicely and beautifully. The plunger is indeed so much easier to use than the wooden mold. Well done ! 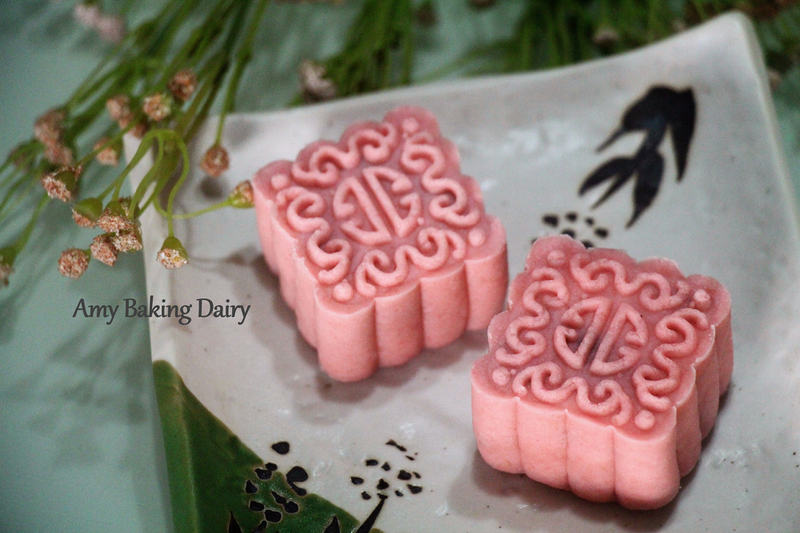 I like these lovely pastel colour mini snow skin moon cakes of yours. Happy Mid-Autumn to you & family! It has been decades since I made any. 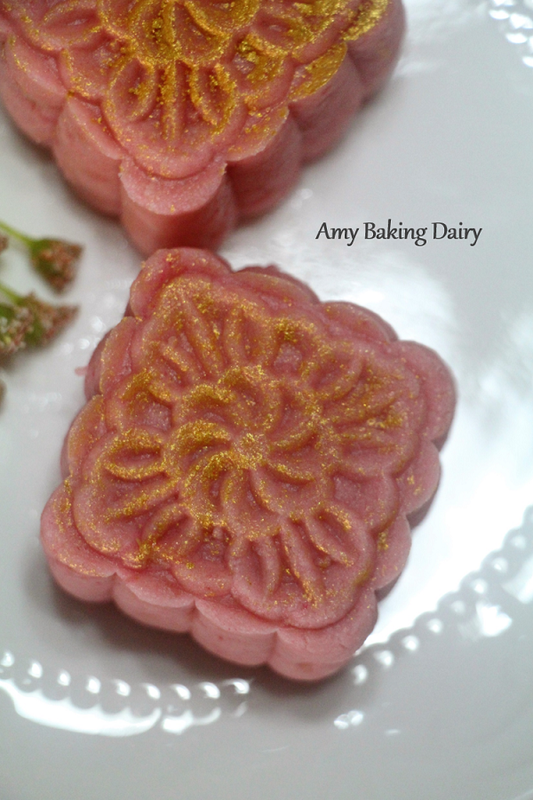 And I lost my mooncake mould to someone I loaned it to! Have not made any since then, and am lazy to anyway! Great job on your mooncakes! So beautifully made! Hi Amy, well attempted, looks good. This year I wasn't in mood to make Ping Pei. Lacks motivation.